MerchantCircle | Blog: Attaining 'Top Merchant' Status is Kind of a Big Deal! Attaining 'Top Merchant' Status is Kind of a Big Deal! 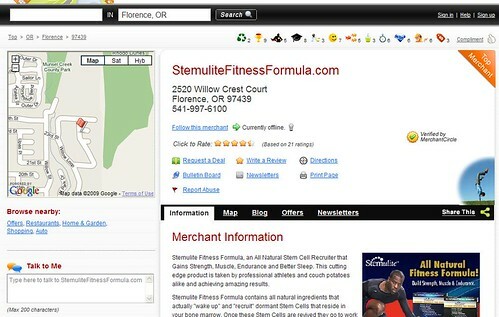 Stemulite Fitness Formula in Florence, OR, recently put out a press release after attaining 'Top Merchant' status on MerchantCircle. Achieving 'Top Merchant' status has proven to boost traffic to your MerchantCircle listing - for some, by over 300%! Matthew Wagner, Chief Executive stated, "We are very proud of this promotion from MerchantCircle.com. Although we have used their services a very short time we have already networked with hundreds of businesses and we have our eye on thousands more. I like to think of MerchantCircle as FaceBook for business." Becoming a 'Top Merchant' isn't that difficult and the results are proven. You can log into your dashboard and get to the requirements here - or look below. Take the first step to gaining more customers for your business. thanks for any help, I tried the forum,didn't work. Merchant Circle rewards a little hard work with increased Search Engine exposure and ranking and, yes, your very own Top Merchant Badge.